At the beginning of every season, I begin to surf the net inquiring about new and upcoming products. I, then, create a list of beauty products I want to try out and review. Sometimes the makeup artists at ULTA, Sephoras, and other makeup counters are taken off guard when I know more about their products than they do - what's new, what it is, when is it being released, etc. With Summer on its way out and Autumn on its way in, a lot of wonderful new products have been released - Urban Decay's Revolution Lipsticks, Butter London's Lip Balms and Creamy Cheek Stains, Bobbi Brown's Sheer Lip Colors, Cargo's Essential Lip Colors, and Marc Jacobs Lip Gels. Fortunately, a new ULTA opened up nearby and distributed cash vouchers and gift certificates to the first batch of hundred people to come in to the store. So, I was able to use coupon vouchers on a lot of these products. I wish I was the lucky duck who picked a $100 voucher. The grand opening event carried on for an entire weekend. My mom and I rushed over to the store every morning and collected about six vouchers worth $5-$10 each between the two of us. We got two bonus vouchers because my dad agreed to accompany my mom on one of the days when I was not able to attend. Some people brought extended family members and friends along. One by one I will be reviewing all of these wonderful lip products here on my blog. I have already reviewed the Marc Jacobs lip gel here, so be sure to take a look at that as well if you are interested. 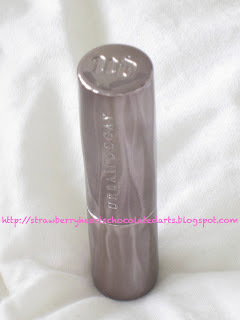 Today, I am sharing my review of an Urban Decay Revolution Lipstick in the shade called Rapture. Claims: "Creamy, Badass Luxury... insane color payoff with creamy shine... plumps... and nourishing oils leave lips cushiony soft." Truth to the Claims? I was initially disappointed by this lip product. I tested a few shades in the store before I decided to purchase the shade Rapture. After testing out and eliminating colors off of my list of colors I had wanted to purchase, Rapture and Venom were the only two that suited me. I was mainly interested in trying out the subtle and neutral shades, such as Naked 2, Liar, Fiend, Rush, and Rapture, and the deep oxblood wine shade, Venom, for the upcoming holiday season. I may purchase Venom in the future, but I think I have enough oxblood, red wine, lip colors to last me a lifetime. My lips are decently pigmented, but not deeply pigmented. My lips can look parched somedays, but it is either because I need to drink more water or have been over exposed to the sun. On most days, my lips feel normal. However, when I tried the neutral to light shades in this range, my lips looked clownish and dry. The colors applied nicely, but looked prominent and pasty. Yes, these lipsticks are richly pigmented and feel creamy, but do not necessarily appear shiny and smooth. 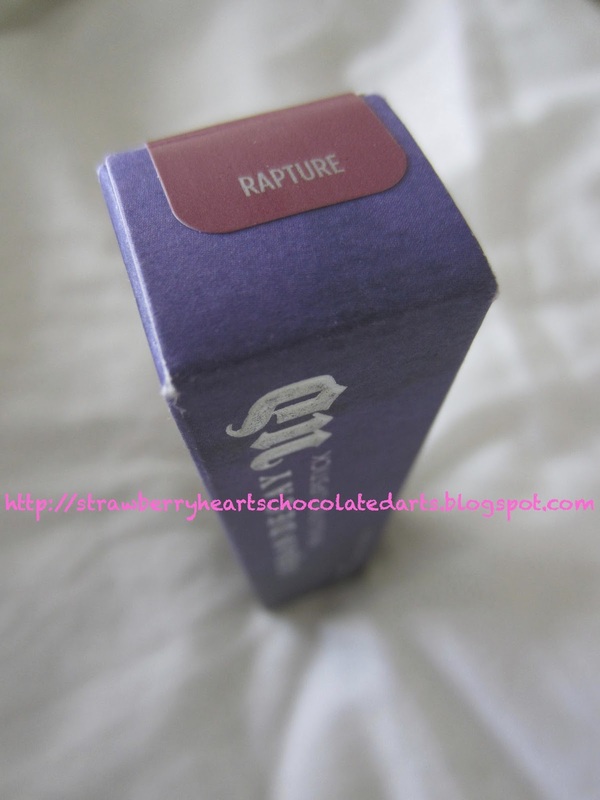 The first few times I wore Rapture, I added a balm underneath or a gloss on top to soften the appearance of the lips. Packaging: I like the light gray, gunmetal, chrome colored tube. I don't like the purple. I am not a big fan of true purple so perhaps that sheds light on my dislike. I would have chosen a darker gunmetal, almost a black granite shade had I been the designer. The gunmetal looks simple and not cheap; a nice variation from the common black high-end packaging. Color: Rapture is a shade encompassing various colors, like lavender, dusty mauve, deep lilac, mid-tone pink, taupe, and plum. I really like the versatility of this shade because could be warn in warmer months as well as cooler months. It is a deep shade, ideal for Autumn and Winter, yet it is not as dark and vampy as traditional wine, oxblood, and burgundy shades that can seem a little out of place in the Spring and Summer. Formula / Application: A rich semi-matte creamy formula. May need to add lip balm as a base or gloss on top for a softer, youthful, and shinier look. See above under "truth to the claims" for more detail. Overall: I think I have added a beautiful color to my collection. I would definitely recommend this lip product, especially the Rapture shade. I only wish more colors looked appealing on me. I am very tempted to try out Rush and Venom in the future! I still have two ULTA coupons left. Who knows? Or maybe I will save the coupons for other new products to be released soon. yet another color from this line I need. Looks stunning on you! I know what you mean about colours not looking good, I can only wear neutral pinks not even red but to me it looks like you can rock all different types of shades!! I have a ud sample from ipsy but it is way too bright for my face and skintone :( Id like to try a lighter colour!